What child doesn't love to hold a crayon in their hands? But children didn't always have such magical boxes of crayons. Before Edwin Binney set out to change things, children couldn't really even draw in colour. Here’s the true story of an inventor who so loved nature’s vibrant colours that he found a way to bring the outside world to children – in a bright green box for only a nickel! With experimentation, and a special knack for listening, Edwin Binney and his dynamic team at Crayola created one of the world’s most enduring, best-loved childhood toys – empowering children to dream in COLOUR! 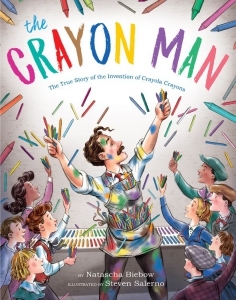 Celebrating the inventor of the Crayola crayon! This gloriously illustrated picture book biography tells the inspiring story of Edwin Binney, the inventor of one of the world's most beloved toys. A perfect fit among favorites like The Day the Crayons Quit and Balloons Over Broadway.